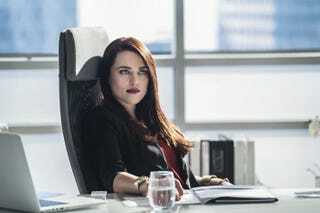 Tonight’s episode of Supergirl once again focused on Lena Luthor, the sister of Superman’s arch-nemesis Lex Luthor, and whether or not she’s evil. Lena Luthor actually has a long history in the comics, starting in the Silver Age. In fact, much like the show, Lena and Supergirl had a long friendship and Lena even knew Supergirl’s secret identity for a while. Today, however, let’s take a look at Lena’s first appearance, in Superman’s Girlfriend Lois Lane #23. Oh yeah. Soak up that cover. That’s some good Silver Age right there. In any case, like most issues, the comic was divided into several stories and Lena’s was the second story, “The Curse of Lena Thorul,” written by Superman co-creator Jerry Siegel with art by Kurt Schaffenberger. So Lois Lane goes to Cardiff’s town library to learn about one very specific witch: Louella Thompson, who had three boyfriends die under mysterious circumstances, so she was burned as a witch. Also, just by coincidence, she looks exactly like that blonde librarian whose name is Lena. Yes, you can probably see where this is going. I love how Lois leaps from “Hey, this woman looks a lot like that witch” to “Hey, the spirit of the dead witch could have totally been reincarnated into Lena.” Never let it be said that Lois can’t put two and two together and get twenty-two. Of course, there does tend to be some evidence. Lois tries to quell her fears, but she can’t and ends up confessing everything to her sister. I love how “upset a witch” is literally her explanation for why this is happening. In any case, if that whole “LUTHOR ESCAPED FROM PRISON!” thing didn’t tip you off, yes, it turns out that it was Lex behind everything the entire time. He didn’t want Lois to write an article about Lena, because Lena was DUN DUN DUN his sister! But hey, Superman already knew that! HOW? In any case, that’s the first appearance of Lena Luthor. She would go on to become Supergirl’s friend, gain telepathy, lose telepathy, learn Luthor was her brother, and eventually vanish due to the Crisis on Infinite Earths. Post-Crisis, Lena Luthor was Lex’s adopted sister who was killed by their foster father, so he named his daughter after her — of course, he then put his daughter into an induced coma and then traded her to Brainiac 13 for future technology. Eventually, a Brainiac-ed Lena Luthor came back as a teenager, reverted back to a baby, and then Superman allowed Lex to raise her again (don’t ever say the modern age wasn’t as goofy as the Silver Age). Post-New 52, Lena was back to being Lex’s sister, this time paralyzed due to a childhood illness. It turns out that she was, in fact, smarter than Lex and he started LexCorp using one of her inventions, but without crediting her. She is currently playing a villain in the pages of Superwoman.